The budget was very limited, reinforcing the need to maintain as much of the existing structure and materials as possible. 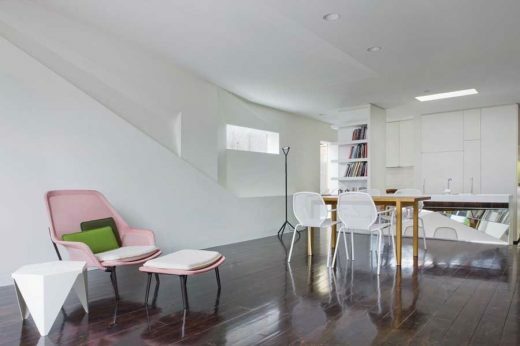 The existing building consisted of a series of ad hoc renovations at the north end of the house. 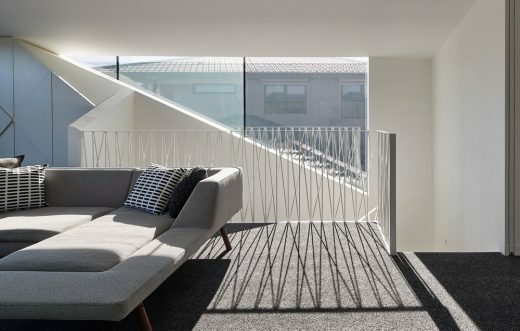 Access to natural light was limited due to the existing roofs and eaves sloping downward to the north ans east, hence causing a very dark interior living space. 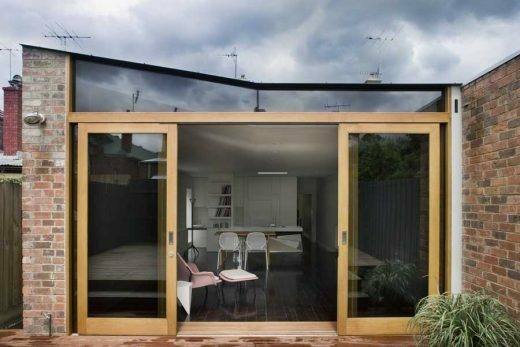 The party wall and shared roof was also required to be maintained to minimise the impact on the neighbouring property as communication with the neighbour was limited. Retaining the existing building footprint was a key consideration for both economical and philosophical reasons. Building expansion was not an essential requirement, and outdoor areas were already limited. Replanning within the envelope and modifying the existing fabric to achieve the required spatial and environmental considerations were major drivers behind the design approach. New full height glazing was installed on the north façade to maximise light into the house. 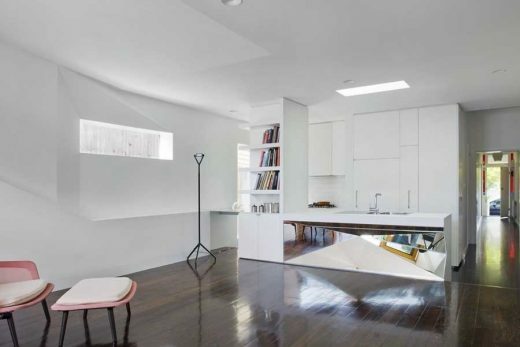 While originally intended to taper upwards to the north evenly at both ends, reworking of the shared party wall proved difficult with neighbours, so it was decided to taper the ceiling to one side only. 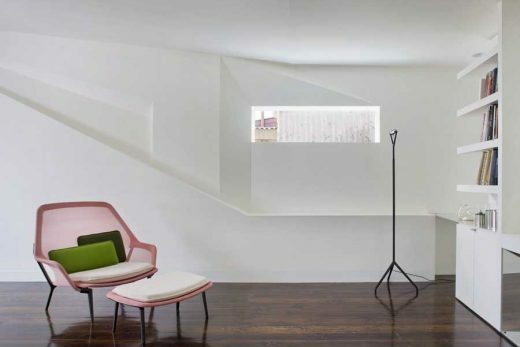 This circumstance was embraced as an opportunity to create an asymmetrically tapering space, with both the walls and ceiling faceting around the existing structure toward the north eastern end. This in turn affected the joinery design; with the island bench folding and faceting its north face in mirror reflect and be a participant in the interior architecture. Materials used were simple and cost effective; all used in unusual ways to hight their natural qualities. 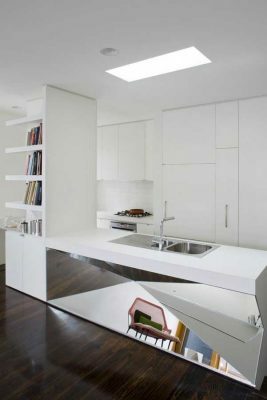 Eg the simple plasterboard was faceted along the east wall and the use of laminate and mirror in the kitchen island bench. Each material used the detail as the highlight rather than opting for expensive finishes. Existing finishes such as the hoop pine floor, existing brickwork and decking were reused wherever possible. The surrounding built environment was celebrated by capturing views of the urban fabric from within. TV aerials, chimneys, dilapidated corrugated fences are presented as framed images from within the interior, and as an integral part of the new north elevation.